A hole-in-the-floor experiment in sound. The second in our series of ambitious new projects by Nicola Singh working with xsite architecture that explored how we interact with, create and are affected by the architecture of our cities. In an old, many years empty building in Newcastle’s city centre, a two-meter-diameter hole was cut out in the ceiling / floor between two storeys. 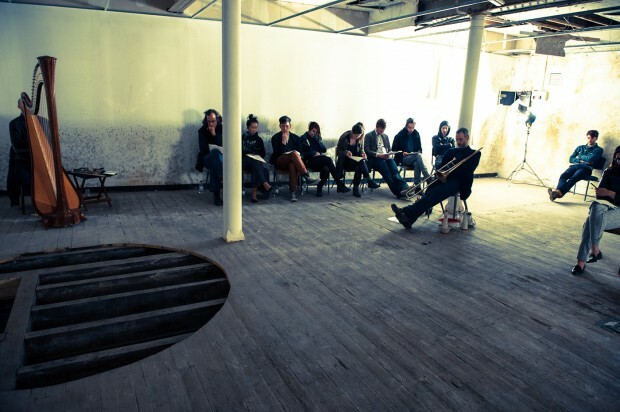 An entirely acoustic performance of experimental music took place across this hole, with the audience seated on the ground floor and performers on the first. From downstairs, the audience culd see only each other, and the hole, while listening to the sound coming through from above them. Some of the UK’s most well-respected and exciting musicians performed strings, brass, woodwind and percussion alongside choral and solo vocals, exploring the full range of sonic possibilities of this altered space. Artists included Rhodri Davies, Paul Dunmall, Chris Greive, Impossibility Knox (Gwilly Edmondez and Greta Buitkute), Mark Sanders, Nicola Singh and Sue Tompkins. Following the performances, Tim Bailey, partner at xsite architecture, discussed the ideas of acoustics and their place in architectural practice.